Is this how Acura will surpass Lexus in the performance arena? The release of the Acura NSX has proven that Honda has a tendency to take in requests for model revivals and churn out something that only vaguely resembles the original. After all, the automaker is sticking with its resolve to over-engineer its cars no matter how expensive or different the result is, and Auto Guide has just uncovered its ploy to filter pleas for a scaled down NSX through this design philosophy. Uncovered July 17th, these patent images filed with he European Union Intellectual Property Office depict what could be the “baby NSX." 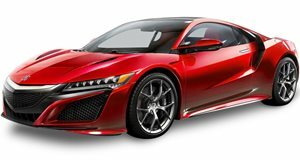 Essentially, it's a less expensive and smaller alternative to the second generation NSX, which enthusiasts hoped would be a more attainable mid-engine sports coupe like the first generation NSX. Though AG made mention that this could potentially replace the front-engine S2000 roadster, it looks sophisticated, futuristic, and mid-engine enough to be another animal entirely, and Honda is likely to charge a premium for it. If the exterior design doesn’t make that plain, feast those eyes on the interior, which is made visible thanks to having the rendering's roof removed (the lack of A-pillars alludes to this while the missing opening for a top means this is probably not a convertible). Inside it’s possible to spot a low-slung driving position, an NSX-like dashboard, and a Formula 1-inspired steering wheel. If it’s the baby NSX we heard whispers about ages ago, expect it to preserve the hybrid drivetrain that Honda managed to ace on the current NSX albeit with less horsepower, somewhat contradictorily given how this design looks more aggressive. Rather than take on the Porsche 911 like the current NSX, the baby will fight the Porsche 718 Cayman while coming in at a competitive price. If it looks anything like these patent drawings, expect it to win the popularity contest as well. As with most patent images, only time will tell what the automaker is thinking, but our hopes are high with this one.